Secret Antiquities #1 was written by Michael Curtis. Art is by Michael Curtis, François Le Douarin, Bradley K McDevitt, Jacob A. Riis, and WikiCommons. The publisher is Freak Flag Press. 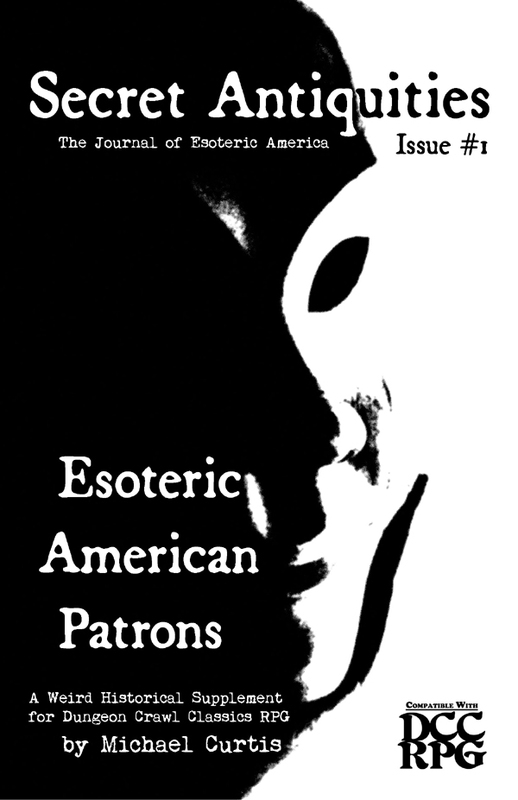 So, what is Esoteric America? "The Land of the Freak and the Home of the Strange". According to the author, this is a Dungeon Crawl Classics setting inspired by his "own interest in the folklore, weird history, and strange happenings that make up the story of America." The idea is that this is a hidden America, lying hidden behind the nation that appears on the surface, and "unknown to the majority of its residents." This is a setting that is inspired by the esoteric lore of our modern age. "American history (both pre- and post-European contact), folklore, music, urban legends, pseudo-science television documentaries, and tall tales comprise the headwaters from which the Esoteric America setting flows." The first issue of Secret Antiquities focuses on patrons for Esoteric America. You can, of course, use and adapt this material for other settings, especially settings like the American West of Dark Trails or Black Powder, Black Magic...or post-Apocalyptic Umerica! Hopefully, the author will offer some glimpses in future issues that demonstrate how games set in Esoteric America "in any region of the country and in time periods ranging from when the first settlers crossed the land bridge from Asia up until the modern age" might be structured. I am imagining a series of one-shot adventures, possibly building to campaigns that tell long stories from the perspectives of many characters over generations (like Stephen Spielberg's Taken), but the author may have other ideas. Introduction: What it says on the tin. It's three pages long, and everything quoted after "The Land of the Freak and the Home of the Strange" comes from it, so you may wish to give it a read. This inaugural issue contains seven patrons: five of which are fully described including invoke patron tables, spellburn, patron taint, and new spells, and two abridged patron descriptions with only the invoke patron tables. Although designed for Esoteric America, guidelines are given for each allowing them to be easily used in more traditional DCC RPG campaigns. First Manifestation: When the patron first appeared in America. This lets the prospective judge know what eras of American play a patron should appear in. Uncle Sam, for instance, isn't around yet if your PCs are crossing the land bridge from Asia. Status: Is the patron still around in the 21st Century? Has he been weakened? Changed? Again, this gives the judge some guidelines for using patrons in different time periods. Alignment: In mainstream Dungeon Crawl Classics, the alignments of patrons are not given, although some of them should be clear based upon the nature of the being. If it is a god as well as a patron, alignment can also be determined by checking out its information for the cleric class. I am not certain this information is really needed here. Demands: What the patron wants from you. While I am not certain that alignment is needed in Esoteric America, I am certain that this would be useful information for any campaign setting! Other Campaign Settings: How to adapt the patron to other campaign settings. The author questions why you would want to. Uncle Sam: This iconic figure is given a full patron write-up. You can see a sample of this patron here. The Anti-Sam: The patron of the American nightmare (who is either Chaotic or "perhaps horribly Lawful") is given a full patron write-up. "The Anti-Sam stands for those who only stand for themselves, profiting on death, misery, and hatred." The Old Man of the Mountain: Also known as the Great Stone Face, this is an ancient patron of knowledge and the land. "Although seemingly as eternal as the mountain which it adorned, the Old Man of the Mountain's existence came to an end in the early morning hours of May 3rd, 2003, when the stony profile collapsed in roar of falling rock. Locals left flowers at the base of Cannon Mountain, touched by a loss they could not adequately explain." A full patron write-up is provided. Stagger Lee: The patron of badasses is given a full write-up. The Dead Rock Star: The patron of Fame and Excess can be any dead rock star - Buddy, Elvis, Janis, Jimi, or Kurt. Have you run Rock God Death-Fugue? Those PCs might be other incarnations of the Dead Rock Star. There is a full patron write-up. Emperor Norton I: The self-declared "Emperor of the United States and Protector of Mexico" is the patron of the benevolently mad and those enslaved by circumstance. Although only given a partial patron write-up (general information plus invoke patron results), the real-life inspiration makes for interesting reading that I wasn't aware of. This patron still has an impact on the San Francisco area, and is still active in Esoteric America! Mrs. O'Leary's Cow: The cow might not have started the Great Fire of Chicago, but in Esoteric America she gets the credit, and is the patron of arsonists. A partial patron write-up (general information plus invoke patron results), is provided. Everything you’ve heard is true. Witches practiced black masses in the woods around Salem. Frozen alien bodies are stored in clandestine government installations. Washington D.C. was designed by geomancers to harness ley lines. The shot that killed President Kennedy was a magic bullet. Phantom hitchhikers travel the country’s highways, bound for a location no living soul should ever see. A secret war is being waged for the soul of the country. And without you even knowing it, you’re caught in the crossfire.